Piazza Garibaldi, 32, 80142 Naples, Italy. 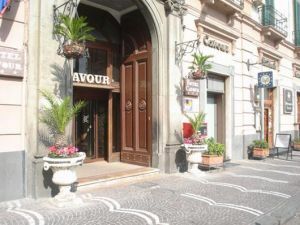 Hotel Cavour Located in the centre, which is 200m from the central railway station and just a few metres from the old town. This is a 1900s style hotel which offers 100 well-equipped rooms with hair-dryer, minibar, complimentary bathroom items, TV and some have a terrace with views. The French style bar has internet connection and is ideal for meetings. There is also a conference room with a capacity for 100 people. 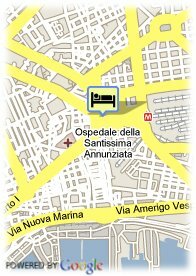 Valet parking, Free open air parking at the hotel, Paid covered parking at the hotel (15.00 €). Near trainstation, Near to the university, Centre, Museum Area, Near highway, Near the historic centre, Near airport, Near shopping centre. Visa, Diners Club, Maestro, Mastercard, American Express, JCB, CartaSi, Discover. In our restaurant, where breakfast is served, it is possible to taste typical Mediterranean dishes in an elegant and relaxing place.